Reactoonz is a slot by Play’n Go that very rapidly has become one of our all-time favourites. 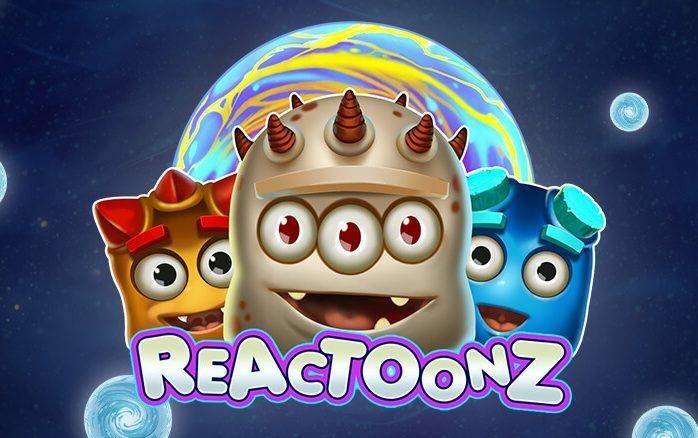 And it is not just us: Reactoonz is, despite a somewhat steep learning curve, one of Play ‘n GO’s most popular slots. This is all because of the excellent potential and the unique, suspense building features of Reactoonz. Payouts of several thousand times your total bet occur frequently, and the fun thing is: they are built up step by step. High variance slots have become the most played slots in the past years and Reactoonz is easily one of the best. This creates an enormous amount of tense excitement, that will entice you to play on time and again. In this slot, your play frees up bonus boosters that help you to create (large) payouts. And sometimes you succeed in freeing up the gigantic Gargantoon; a 3 x 3 wild that especially in combination with the multipliers and the high-value symbols can deliver simply, well… gargantuan payouts. So, we play Reactoonz on a very regular basis and are quite often successful in obtaining handsome rewards. 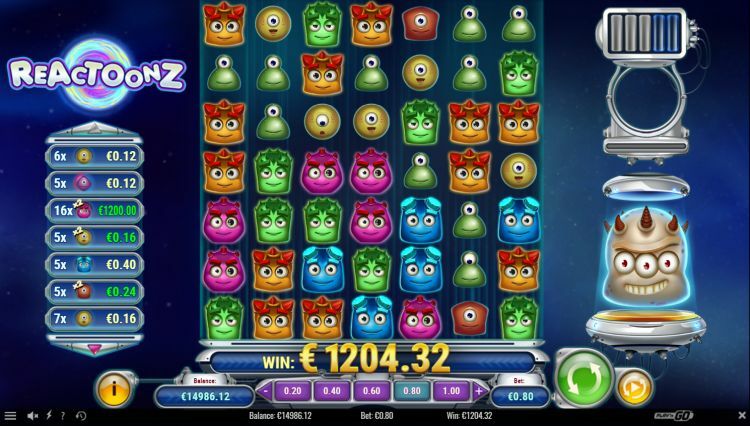 We managed to grab this fantastic payout with the Reactoonz game, which surely is one of the best slots by Play ‘n GO. Play ‘n GO is well known for the innovative slots they bring to market, full of unique game mechanisms and bonus features. Slots such as Moon princess, Book of Dead, Viking Runecraft, Gemix and Reactoonz are very popular indeed. The aim of Reactoonz is to make clusters of the same symbols. There are also wilds and multipliers active. The larger the cluster and the more value the symbol has, the bigger the payout will be. There are also extra boosters that you can earn in the meantime to fill up the gauge that is on the top right-hand side of your screen completely. When you succeed in this endeavour, you won yourself the notorious Gargantoon feature: this will give you 3 rounds with extra wilds added to the screen, starting with the mega wild of 3 x 3. 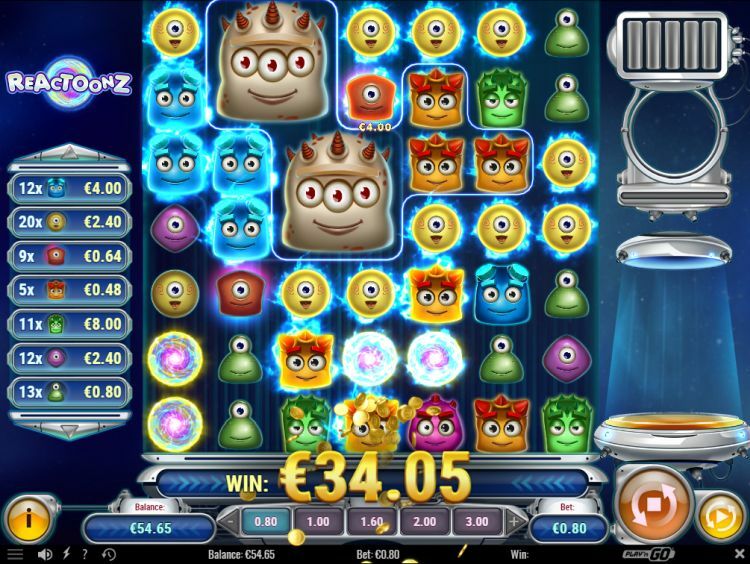 The end result for us, after getting the Gargantoon feature, was a total win of $€ 1,204.32. With a bet of $€ 0.80 per spin, this amounts to 1,505 x the total bet. Where can you hit a Super Big Win on Reactoonz? You can find the Reactoonz slot at all reliable Play ‘n GO casinos. One of these Play ‘n GO casinos is Casumo, which is one of our favourite online casinos. You can play Reactoonz at Casumo with a 200% bonus up to $€50 plus 200 free spins.